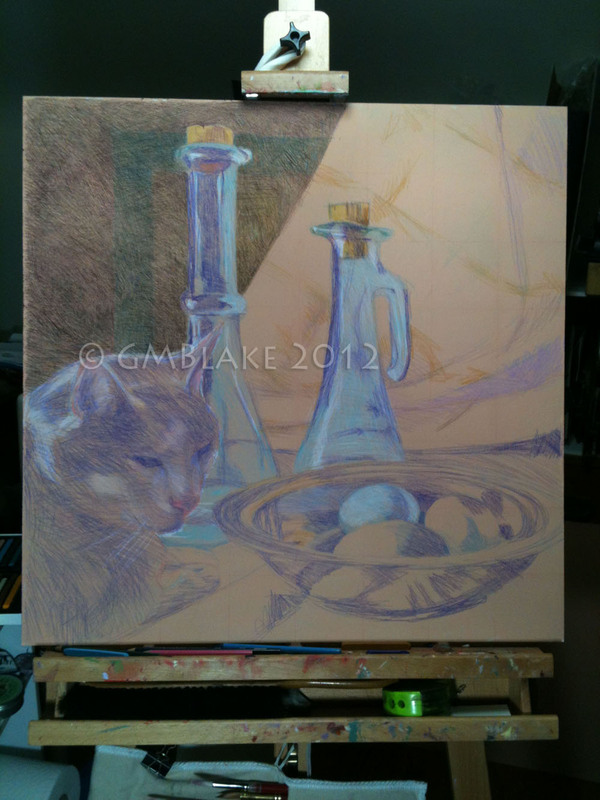 In keeping with my new series (feathered and feline), I’ve begun a new still-life with eggs and cat. I like to amuse my Facebook friends by posting progressive photos of art as I work on it, and I’ll be moving that entertainment to these pages. With this posting, I’m duplicating what I’ve already put up on FB. Eddie was my cat-boy, a foundling from Montrose PA who was with me through thick and thin. I miss him a lot, though he’s still with me in spirit and in my dreams. The blue eggs are from the Binghamton farmer’s’ market, and they are so beautiful I’ve saved many of the shells – though I’m not sure what I’ll do with them. 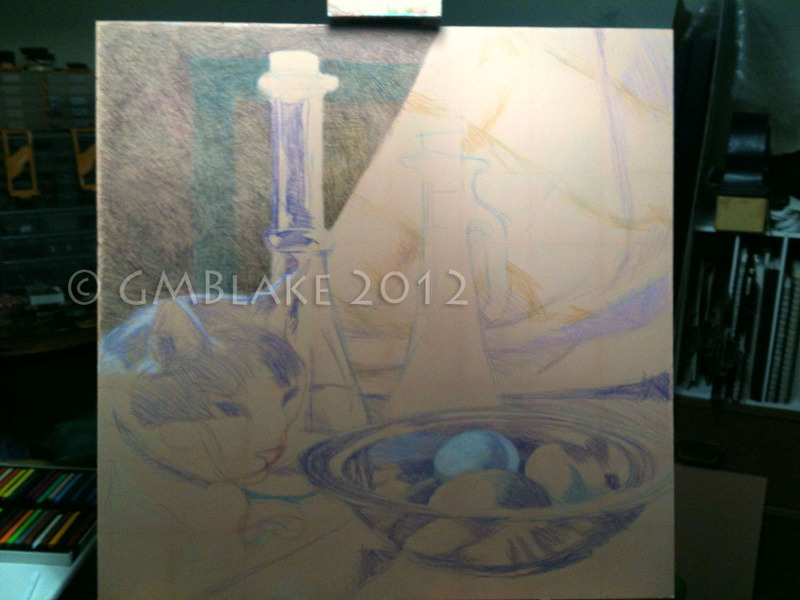 This piece is in colored pencil on painted masonite, 24 x 24″. The ground is a flat latex paint recently used in the front room of our house. 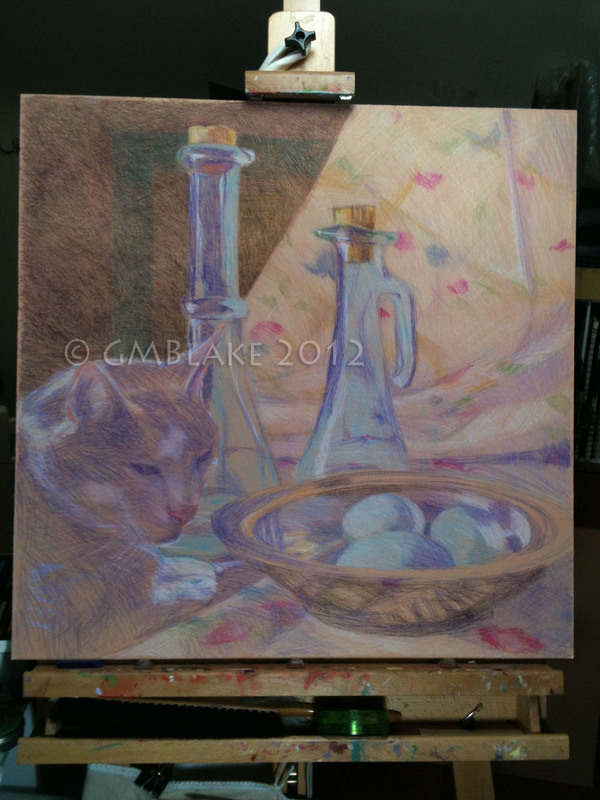 I love the inobtrusive warmth of the color, and thought it would be a good foil for the cool colors in this composition. Unlike a ground applied with a roller, the brushed-on paint produces some wonderful accidental textures. The tooth of a flat paint is delicate but satisfying, though once covered by a couple of layers it loses grab and I have to apply more – as well as stabilize the previous layers – with workable spray-on fixatif. Deepening shadows, working in some mid-tones and highlights. Nearly all of the first layers down. 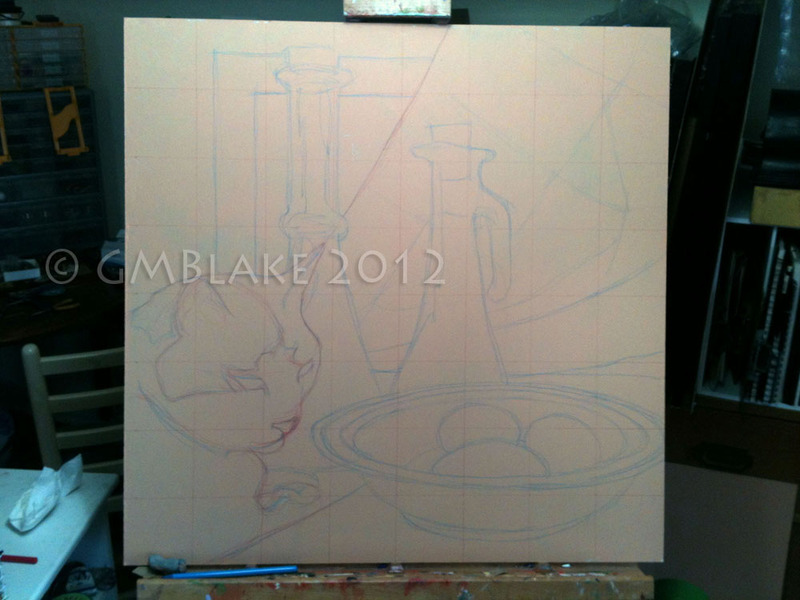 Next: workable fixatif to seal the initial layers, then further refinements of lights and shadows. I'm really pleased with the way this is coming together!